Robert Matthew-Walker, born in London in 1939, is best-known as a leading critic and writer on music, of a wide range - covering classical, pop and rock music. But he is also a composer of an equally wide range of music, having studied with the French composer Darius Milhaud in Paris in 1962-63. 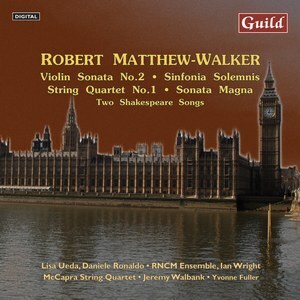 This is the first CD to be devoted entirely to Robert Matthew-Walker's music, and opens with the impressive recent Violin Sonata No 2, recorded live at the Wigmore Hall in a magnificent performance by the exceptionally-gifted violinist Lisa Ueda with the outstanding Swiss pianist Daniele Rinaldo - a work described as '…one of those few new works I want to hear again very soon', '…very fine', and '…a triumph' by the critics. Also included is the major percussion work, Sinfonia Solemnis, the large-scale String Quartet No 1, and the astonishing Sonata Magna for organ, recorded at Cologne Cathedral. Two Shakespeare songs, with the composer at the piano, complete this important collection.